Thanks to pressure back in Germany, the United Auto Workers are on the verge of unionizing a Volkswagen plant in Tennessee, and making labor history in the process. Lately, the only battles labor unions have seemed capable of winning in the private sector have been PR battles. McDonald's workers go on strike for a day to raise awareness about low wages? That counts as progress. A few Walmart workers walk out in protest on Black Friday, only to be casually ignored by the hoards of shoppers racing for waffle irons? Well, at least they nabbed a few headlines. However, something a bit different, a bit more tangibly significant, appears to going on in the auto industry right now. The United Auto Workers may well be on the verge of accomplishing a longstanding and elusive goal: organizing a foreign car maker on American soil. This week, its leaders reported that more than half the workers at Volkswagen's manufacturing plant in Chattanooga, Tennessee had signed cards favoring union representation. As a next step, Volkswagen could simply choose to recognize the UAW without a fight, or it could force a certification election through the National Labor Relations Board. Negotiations between the two sides are ongoing, but the union seems to have at least some momentum. 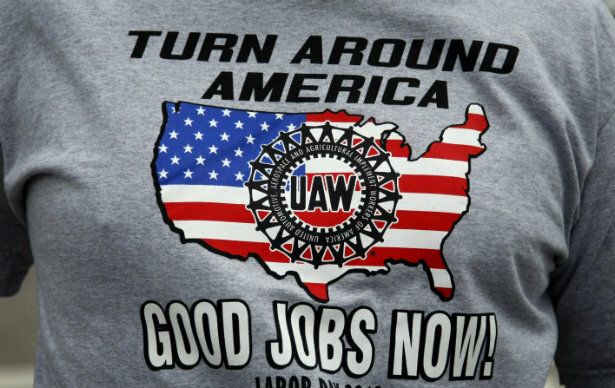 If the UAW does prevail, it will be a camper-sized milestone for the auto industry. The once-mighty but long fading union has never successfully organized a factory owned entirely by a foreign car maker. And with its finances wobbling thanks to membership declines, many believe that cracking transplants like Volkswagen, Nissan, and Toyota has become a do or die task. Union President Bob King put it bleakly in a 2011 speech, telling the crowd: "If we don't organize these transnationals, I don't think there's a long-term future for the UAW, I really don't." So why is this drive succeeding where other have failed? As Matt Yglesias has written, it's largely because Volkswagen is a German company. Whereas labor management relations in the United States tend to be treated as a light form of trench warfare, in Germany, workers are given a very strong say over company decision making, in part because their representatives sit on corporate supervisory boards, which are akin to American boards of directors. In the case of Volkswagen, members of the labor contingent that makes up half its board have taken a stand, stating that they won't support a potentially major expansion of the Chattanooga plant unless it adopts a German-style works council. What's a works council, you ask? Not a labor union, to start. In Germany, unions deal with collective bargaining. The works council, meanwhile, meets with management to talk about issues like vacation time, workplace safety, and ways to make production more efficient, while sending delegates to the all important supervisory board. The Chattanooga plant is Volkswagen's only facility without such a body. But here's the catch: under U.S. labor law, companies can only have a works council if employees are represented by an outside labor union. Hence, thanks to pressure from its workers back at home, Volkswagen America is now considering crossing the event horizon of full on unionization. That said, the UAW is promising that this arrangement won't be business as usual. Rather, they seem to be hewing to the idea that the union really will be importing the German works council model. A UAW official told the Associated Press the the its "role would be 'totally different' from established relationships with U.S. automakers," adding that it would be a "new form of representation." Unfortunately, he said he couldn't divulge any details just yet. But frankly, even if the UAW were to treat Volkswagen on the exact same terms as General Motors, Ford, and Chrysler, it wouldn't necessarily be a disaster. Volkswagen starts its employees off making around $15 an hour, which is just about the same bottom-level wage the UAW agreed to with the Detroit Three in the last round of contract negotiations (the big difference is that the Detroit automakers are only allowed to pay 25 percent of their workforce that amount by 2015). Instead of bargaining for higher pay, the union's has focused recently on convincing U.S. car giants to keep jobs at home instead of shipping them of Mexico. Considering Volkswagen is already a foreign brand, the last thing the union would presumably want to do is convince it to send work back abroad. On Thursday, Sen. Bob Corker (R., Tenn.) said he is in "constant contact" with senior U.S. executives at Volkswagen and urging the auto maker to find a way of keeping the UAW out of the plant. "We are talking with them all the time," said Mr. Corker, a former mayor of Chattanooga who helped bring Volkswagen to Tennessee. "I'm reminding them that bringing the UAW in [to the Chattanooga plant] would damage our community's prospects and damage our state. We know that right now it's hurting our efforts to recruit other employers, other manufacturers to Tennessee." And Corker might well be telling the truth. Foreign automakers colonized the South precisely because of its animosity towards unions. American manufacturers like Boeing have tried to do the same in recent years. And if the UAW is really softening attitudes towards organized labor in the region, it might give certain kinds of manufacturers pause. At the same time, the panic seems a bit overwrought. If the UAW really is trying to mimic the German way, to give workers a say in their company without the militancy associated with old school industrial unionism, they may be hitting on a model a lot of workers, and a lot of corporations, could warm to. Labor is fighting a PR battle, after all.